Get step-by-step directions for this tour by downloading our mobile app. 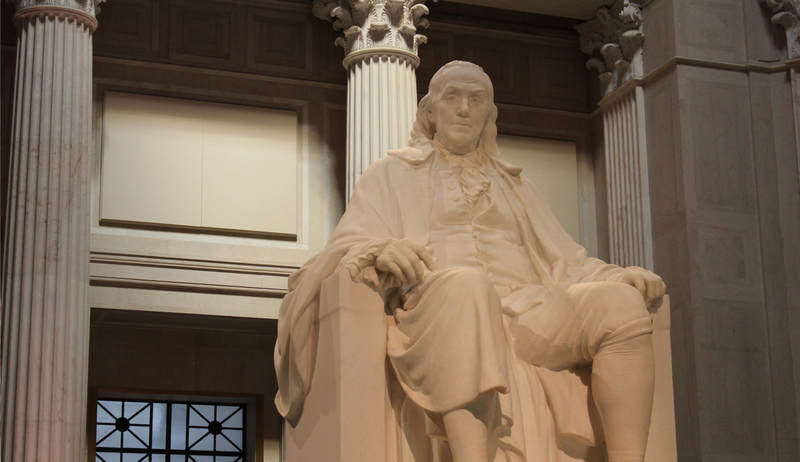 American sculptor James Earle Fraser created this maquette (French for “scale model”) in 1938 as a reference for the Benjamin Franklin National Memorial on display in Memorial Hall. You can see the “sculptor’s points” (black dots) that were used as a guide for the final monument—which is nearly four times Franklin’s real size. 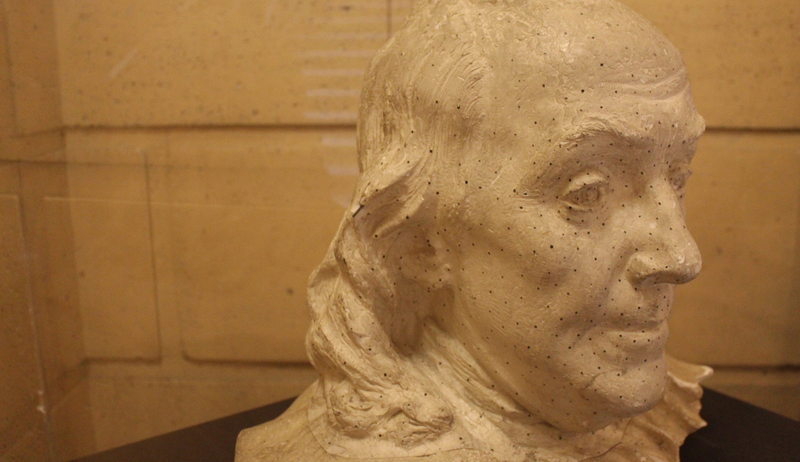 During his time in France, Franklin sat for many artists, including sculptor Jean-Jacques Caffieri. This marble bust is a copy of one attributed to Caffieri circa 1800. Franklin liked Caffieri’s original so much that he purchased it for himself. 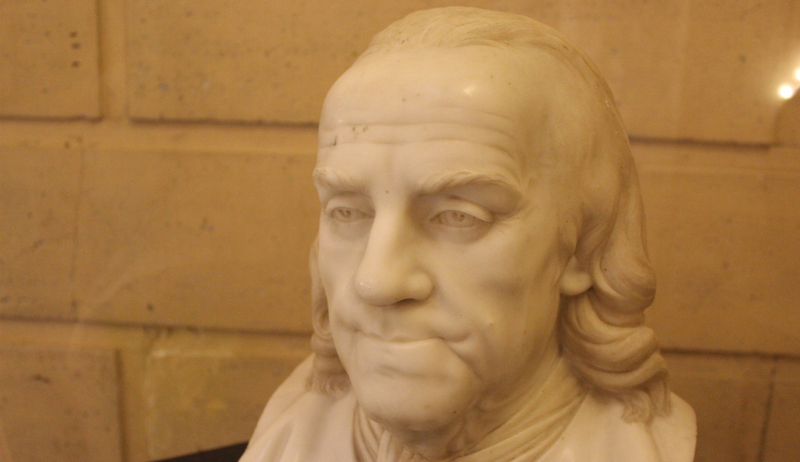 Preeminent French sculptor Jean-Antoine Houdon brought Franklin to life in his 1779 creation—despite never having the statesman sit for him. 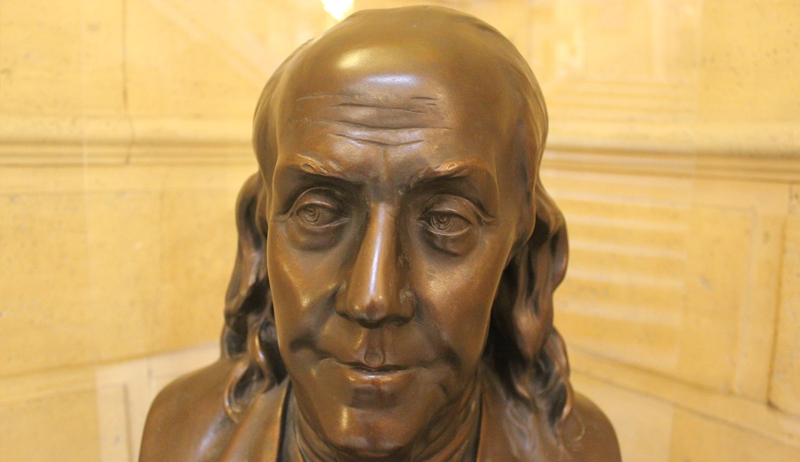 The artist created an intentionally asymmetrical face that emphasizes Franklin’s eyes and his reserved nature, capturing (as the Philadelphia Museum of Art says) “the outward manifestation of Franklin’s mind at work.” This is a bronze reproduction, circa 1956. The U.S.S. Franklin was the first vessel built at the Philadelphia Navy Yard in 1815. 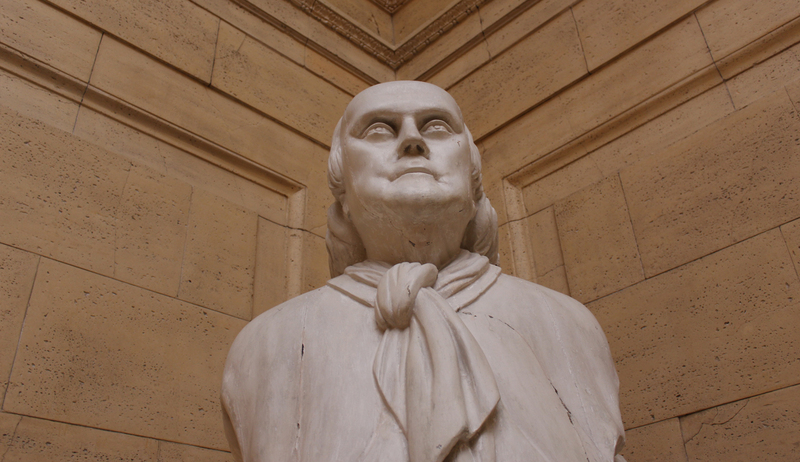 In 1850, it was rebuilt into a steam frigate and Woodbury Gerrish carved this figurehead of Benjamin Franklin for it. In 1930, following the ship’s decommission, the figurehead was sent to the U.S. Naval Home in Philadelphia and later to The Franklin Institute in 1938. 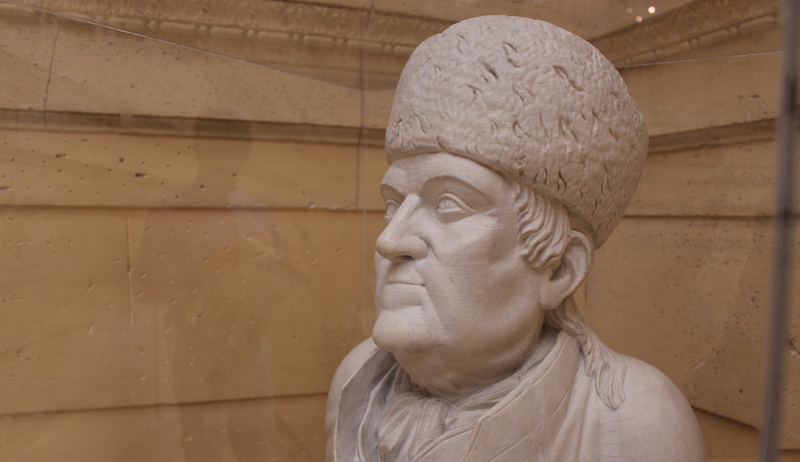 Samuel Skillin, a member of the prominent Skillin family of woodcarvers, crafted this bust circa 1770-1785. The piece stayed with the family for generations. Like Franklin, Skillin was born in Boston and moved to Philadelphia as a young man. It is unknown if Franklin sat for him. 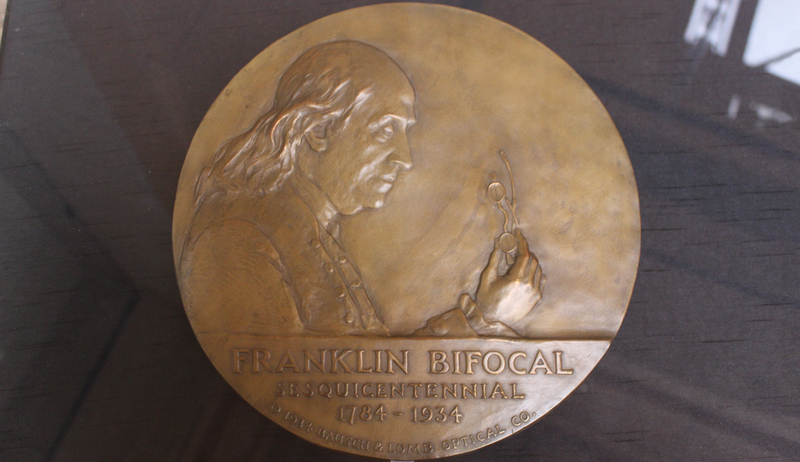 This circa-1934 medallion by Felix Weil was commissioned by the Bausch and Lomb Optical Company to commemorate the sesquicentennial of Franklin’s 1784 bifocal lens invention. While in France, Franklin created the bifocal as a better solution than switching between two pairs of glasses to accommodate his nearsightedness and farsightedness. 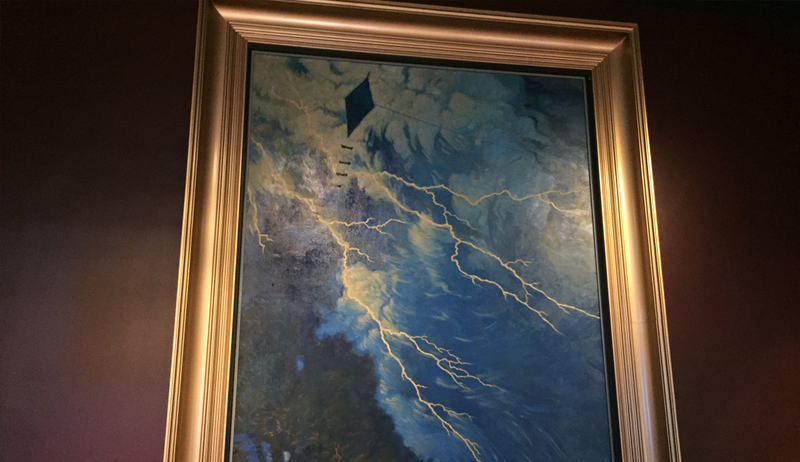 This 1940 painting, part of a diptych (two-panel artwork) by American artist Thornton Oakley, depicts the kite from Benjamin Franklin’s famous June 1752 lightning experiment. The setting comes from the (incorrect) belief that Franklin conducted the experiment in a cowshed near Callowhill Street, a rural area at the time. The inscription at the bottom—"He tore the lightning from the sky and the scepter from the tyrants"—is an adaptation of words by Anne Robert Jacques Turgot about Franklin, his contemporary. 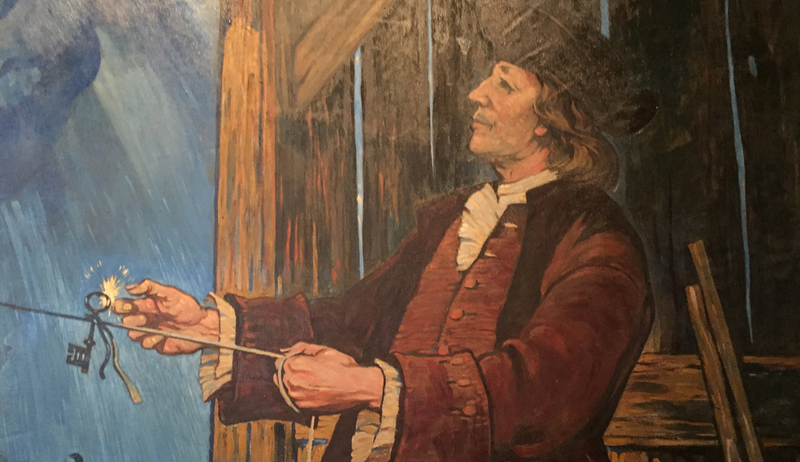 This painting, part of a diptych (two-panel artwork) by Thornton Oakley, depicts 46-year-old Franklin and the key he attached to a kite string during his famous June 1752 lightning experiment. This is believed to be a section of a lightning rod erected by Franklin at the West family mansion at Third and Dock Streets. Franklin first invented the lightning rod in 1749; this piece uses his 1762 design. 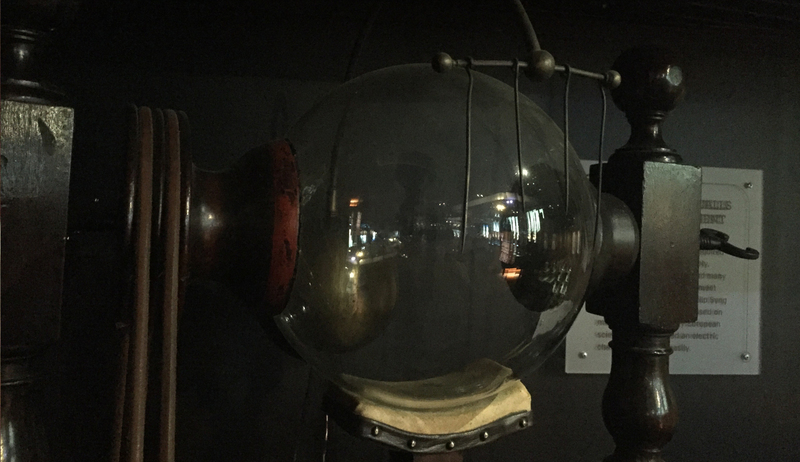 Benjamin Franklin used this machine in Philadelphia for his 1747-1753 experiments on electrostatics. Turning the wheel causes the glass globe to rub against the suede cushion, creating static electricity. Machines like this one were considered vital to experiments and public demonstrations on electricity. 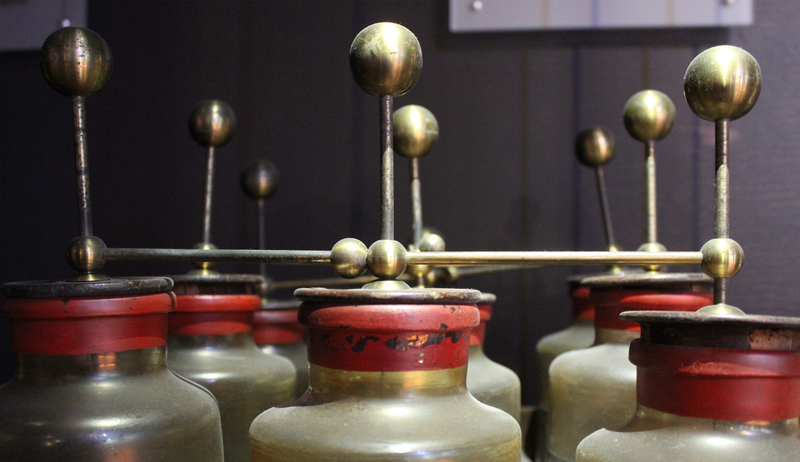 A Leyden jar is a device that stores static electricity. If you link several together, as seen in this box (circa 1820), they produce a larger discharge of electricity. Benjamin Franklin was the first to call this construction a “battery,” using the military term for a row of guns firing simultaneously. 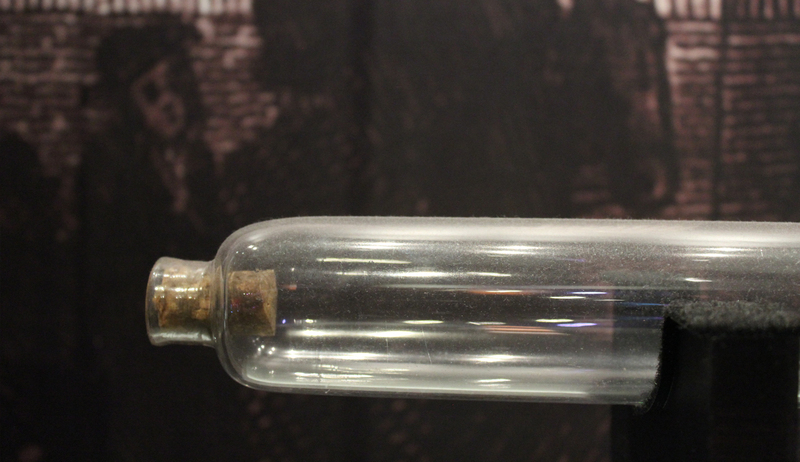 English botanist Peter Collinson sent this glass tube for building up charges to Benjamin Franklin’s colleagues in Philadelphia circa 1747. 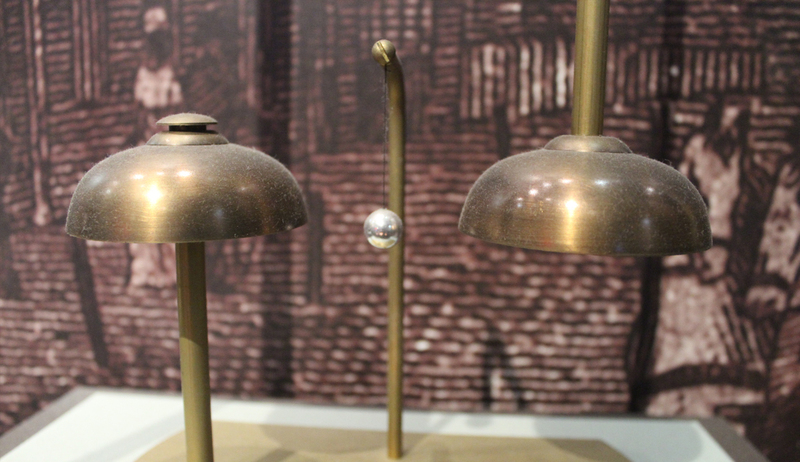 The experiments Franklin conducted using glass tubes led to his theory that electricity is transferred instead of created—eventually leading to the lighting rod and other inventions. 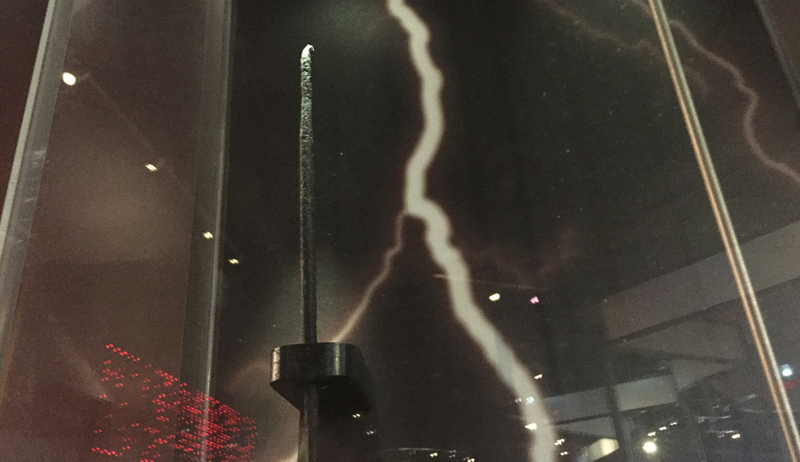 This replica depicts a lightning rod design by Benjamin Franklin in 1752 that followed a German professor's specifications. The electrical charge in the clouds would make the bells ring. Franklin then connected Leyden jars to the rod to capture the electrical charge. 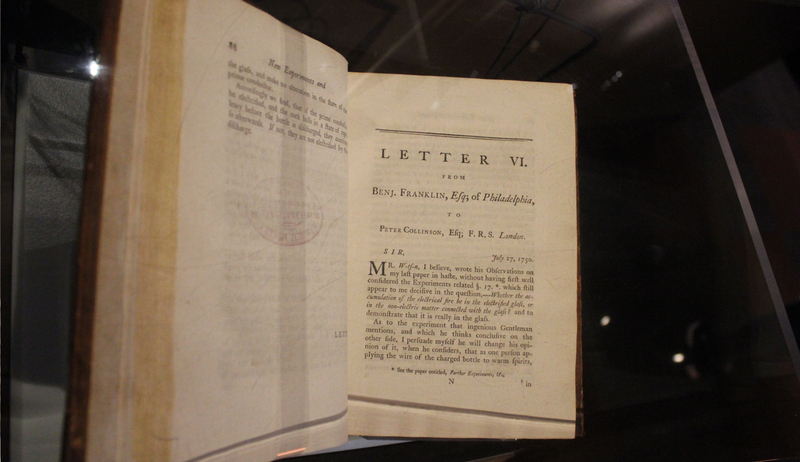 Benjamin Franklin published Experiments and Observations on Electricity in 1751. One of the first books published about electricity, it awarded Franklin international acclaim. In its pages, he coins the terms “battery,” “conductor,” and “positive and negative charge.” Pages of the book can be read on the interactive touch-screen next to the book. 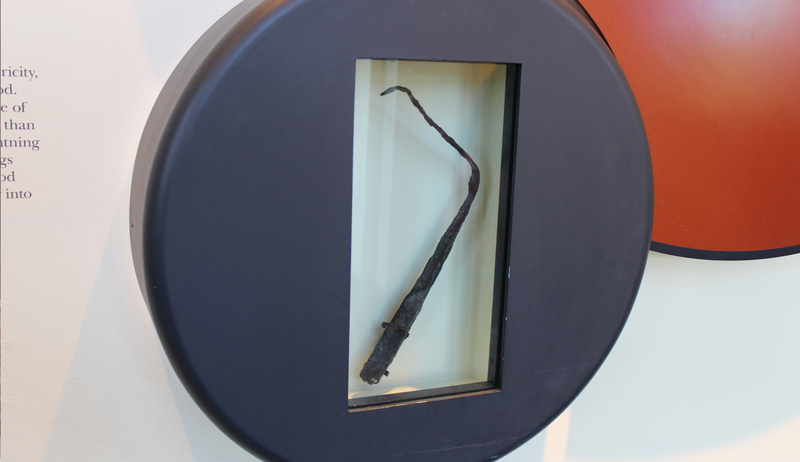 A direct hit from a lightning bolt bent this lightning rod, believed to be one of the earliest erected by Franklin. It protected the home of Mr. Daniel Wister at 141 High Street (modern-day Market Street). Sculptor James Earle Fraser created this enormous likeness of Franklin, which was unveiled in 1938 and weighs 30 tons. Designated a national memorial by Congress in 1972, the Benjamin Franklin National Memorial also encompasses the rotunda, designed by architect John T. Windrim to resemble the Pantheon in Rome.